State Bank of India declared the final result of probationary officer, to fill the 2,313 vacancies. 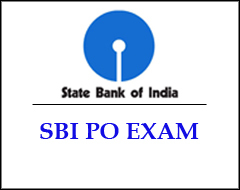 Most awaiting Result of State Bank of India(SBI) Probationary Officer has been declared. Main exam of SBI PO was held on 04th June, 2017. Nearly 6000 applicants appeared in the exam and 2,313 vacancies to be filled. Candidate can their result from the official website as well as from the direct link given below. This link is of complete PDF, displaying roll number of successful candidates. Successful Candidate are also informed through SMS.